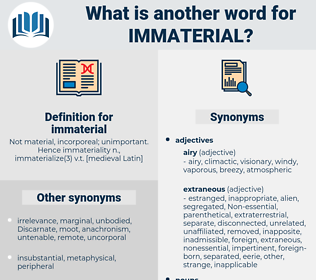 What is another word for immaterial? nothing to do with case. 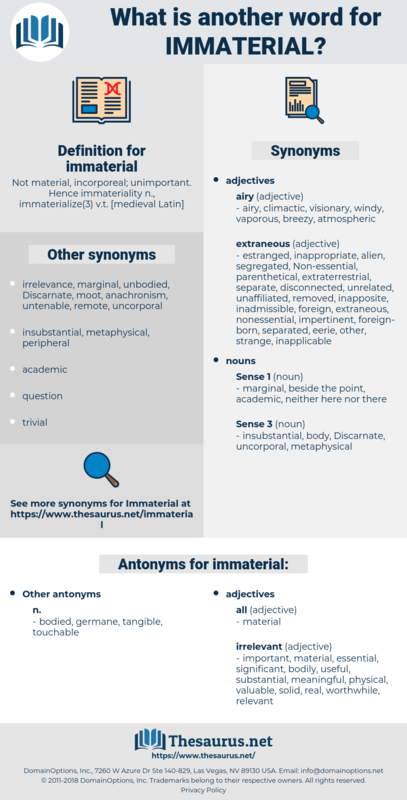 non-physical, intellectual, minor, importance, marginal, extraneous, neutral, impervious, inviolable, soft. intangible, inconsequential, insignificant, trivial, negligible, indifferent, meaningless, inconsiderable, moot, moral, minimal. worthwhile, bodily, real, significant, useful, relevant, solid, valuable, physical, meaningful, substantial, important, essential. She regarded it - or, indeed, any other form of art, for that matter - as amongst the immaterial fripperies of life, something to be put aside at any moment in favour of social or domestic duties.